[SatNews] This service allows content owners and publishers to prepare, manage and deliver content to any network, in any format, on any device. RRsat Global Communications Network Ltd. (NASDAQ: RRST), a provider of digital content management and global content distribution services to the broadcasting industry, announces it will showcase at IBC in Amsterdam its converged service solution for broadcast and online video. This service allows content owners and publishers to prepare, manage and deliver content to any network, in any format, on any device. RRsat has partnered with Kaltura, a leading video technology company, to showcase this end-to-end offering and will incorporate its latest technologies including front- and back-end applications. As viewers habits and experiences are changing rapidly, opportunity exists to monetize the same content over a variety of screens in many different models. A unified and efficient way of preparing, managing and distributing content is therefore required in order to effectively support viewer demand in a cost-effective manner. 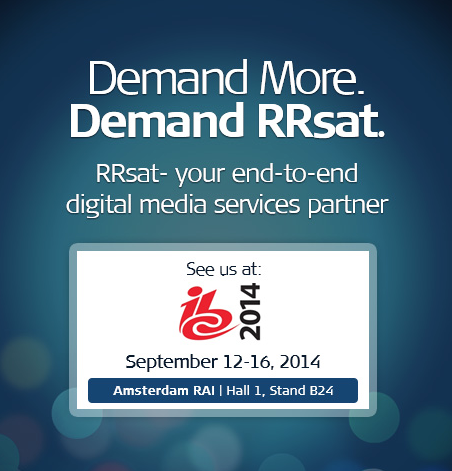 See the converged broadcast and online video offering during IBC in Amsterdam RAI at the RRsat booth, Hall 1 stand B24, 12th-16th September 2014. RRsat Global Communications Network Ltd. (NASDAQ: RRST) provides global, end-to-end, digital content preparation and management, as well as content distribution services to the rapidly expanding broadcasting industry, covering more than 150 countries. Through its Global Network, composed of satellite, terrestrial fiber optic capacity and the public Internet, RRsat provides high-quality and flexible global content distribution 24x7 services to more than 630 channels reaching multiplatform operators, Internet TV and direct-to-home viewers worldwide. In addition, the company offers worldwide content management and distribution services for sports, news and other live events. More than 130 channels use RRsat’s advanced production and playout centers, comprising of comprehensive media asset management services. Please visit the company's website.